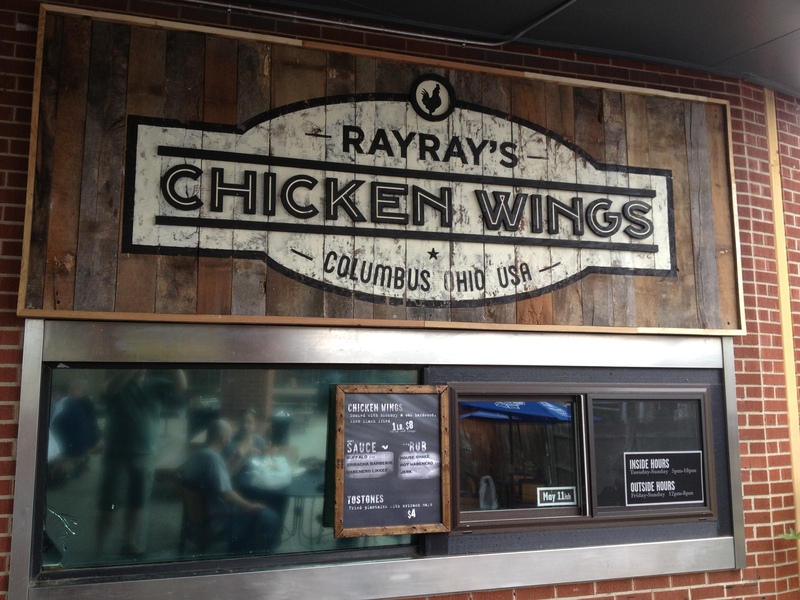 There are several questions the people in North Columbus ask about Ray Ray’s. 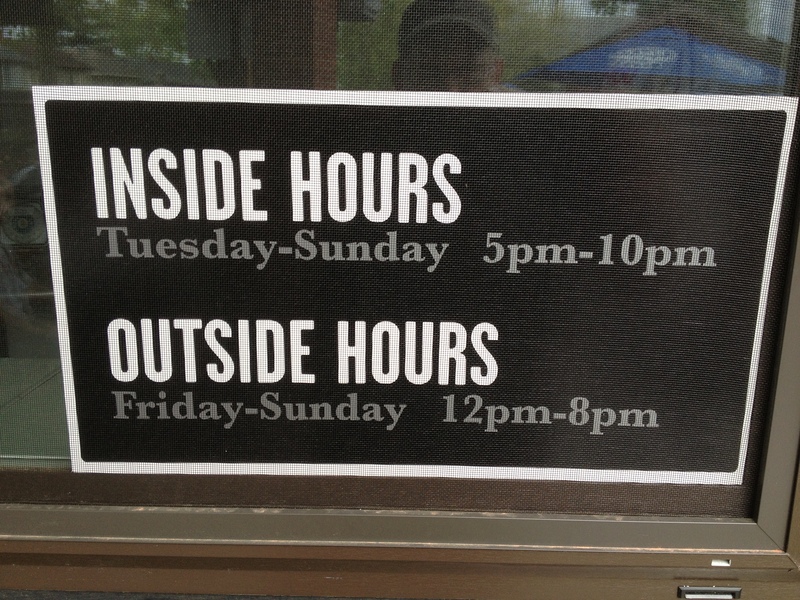 -Why are they just open on weekends? -What happened to the original trailer? -When are they going to open a restaurant? -When will they make chicken wings again? The first and third questions are answered next. Starting on or near or at least close to May 11th, Ray Ray’s opens inside Ace of Cups to serve the people more often with more menu items. Question two – the original trailer is for sale. Hopefully, it will help someone new make great BBQ. And the fourth question. The chicken wings are back, permanently and with a vengeance. Take a look at the menu below. For those of you that have not been to Ace of Cups, long ago it was a bank. The former drive through window has now been converted to a walk up window for wings. 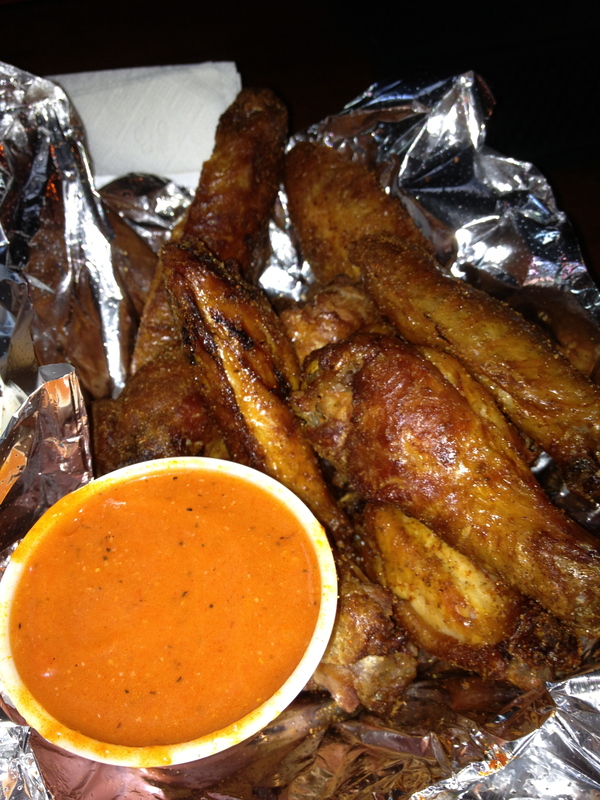 The wings are sold by the pound with a choice of three sauces or rubs. 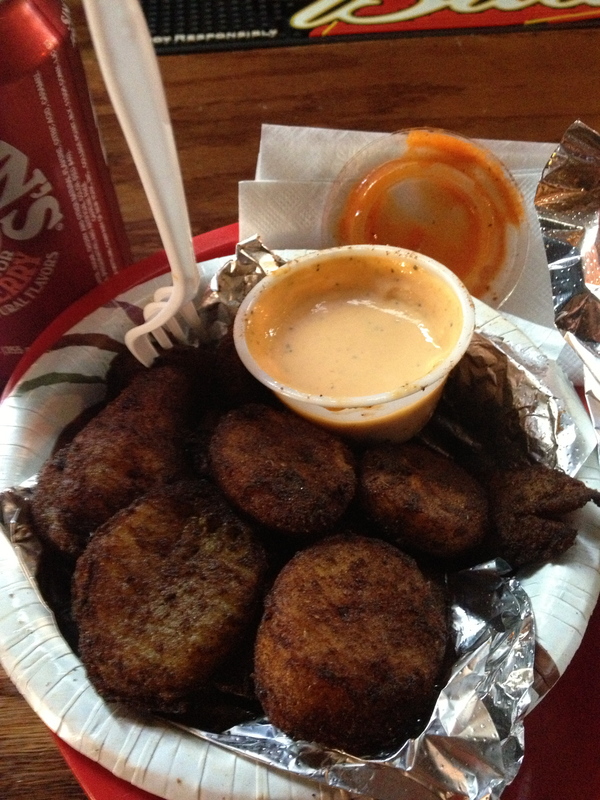 And, going somewhat off the grid, the second choice from the fryer are Plantains. The dish is uncommon in Columbus but I think it will pair well with the beers and other libations at Ace of Cups. The path of many Mobile Food chefs is to go from a menu on wheels to a cuisine under a roof. In the case of James Ray Anderson of Ray’s Ray’s, he has come full circle. Years ago, he honed his craft in restaurants, the last of which was Smackies. In 2009, he moved to a trailer and with a lot of hard work and patience he built a Columbus cult favorite. Now he is blending his two worlds to create one hell of a destination for food, music and beer. After the lines die down and the menu is fine tuned, I am sure I will write about the wings. In the meantime, post a comment and let people know what you think of them. Astute readers (reading after May 17th 2013, who look at one of the photos will see the word Tostones in one of the menu photos. That name last about one day when Jaime (Ray Ray) was informed that his use of the word was not the same as the traditional use of the word in Latin Culinary culture….so it changed it immediately. I stopped in to try the wings on day three of operation. I found them to be good, much better than BW-3. The plantains are decent but I would pass of them the next time. I prefer the style that Starliner Diner and Explorer’s Club serve. 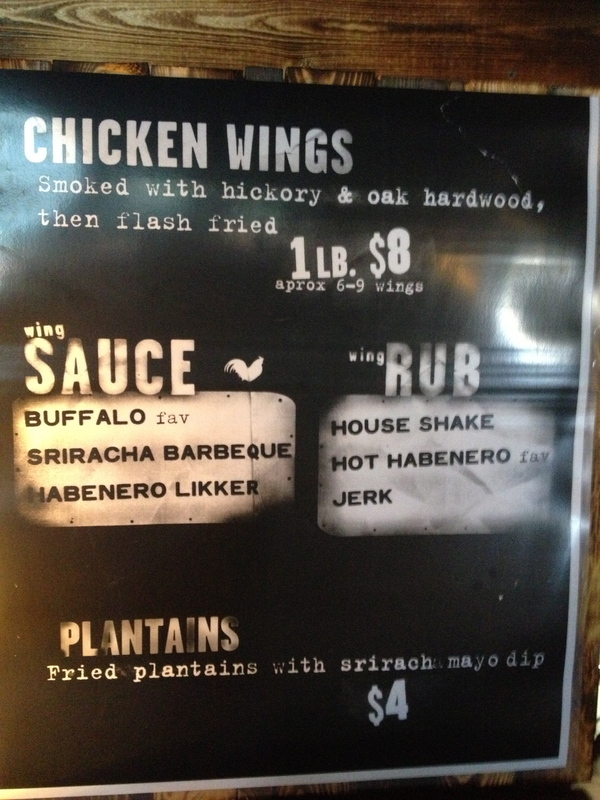 What might I like to see on this menu to go with the wings? I vote potato chips. For a serving suggestion, I would suggest go with a rub and ask for a sauce on the side, as pictured below. The second photo is of the plantains. This entry was posted on May 7, 2013 at 10:45 AM	and is filed under CLOSED. Tagged: Ray Rays Chicken Wings. You can follow any responses to this entry through the RSS 2.0 feed. You can leave a response, or trackback from your own site. Very excited! Chicken wings have been a black hole in Columbus. Ray Ray’s had the best I’ve had in town since I moved here from a town with drastically better wing selection seven years ago. Though I’m a bit puzzled that their house BBQ sauce isn’t a sauce selection. This is some of the best news ever! Thanks for sharing! CMH G. clarification: Please note there are currently no sauces with a Mountain Dew base.